Grazing lands occupy nearly half the Earth’s land area, provide livelihoods for millions, and mitigate climate change via massive stores of carbon. Maintaining and restoring soil health is essential to ensuring these benefits in our ever changing environment. Thus, there is substantial global interest in managing livestock grazing to improve soil health. Grazing is promoted by some as a panacea for sequestering carbon and mitigating climate change. In other cases, grazing is depicted as an ultimate driver of soil degradation. So, what do we know about the relationships between grazing strategy (e.g., continuous vs. rotational grazing system), grazing intensity (e.g., moderate vs. heavy stocking rate), and soil health? Decreased infiltration and soil water, thus increased runoff and pollutant transport. Decreased plant rooting and productivity, thus decreased soil carbon and stability. Decreased soil fertility, thus decreased above- and below- ground biomass and biodiversity. The level of soil impairment is strongly dependent upon site specific factors such as grazing intensity and timing, soil resilience to compaction, and precipitation. 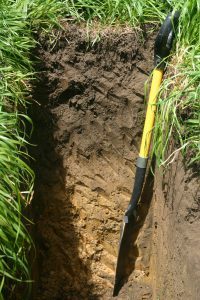 Soil densities and structure that allow root and water penetration of the entire soil profile. Vigorous forage plants with capacity to develop and maintain extensive rooting systems. A community of palatable forage plants with high rooting mass and depth. Stable, resilient increases in primary productivity both above- and below- ground. Any grazing intensity or strategy increases soil compaction relative to no grazing. Rotational grazing reduces compaction and increases soil carbon relative to continuous grazing. Reduced grazing intensity reduces compaction and increases carbon stores. Site conditions such as soil texture and total annual precipitation moderate grazing impacts. Rotational grazing could create climate change mitigation opportunities over continuous grazing. Our findings (Byrnes et al. 2018) suggest that rotational grazing can improve soil health over continuous grazing strategies. Decisions about grazing strategy and intensity significantly influence soil health outcomes, and site-specific conditions play important roles in shaping these out­comes. Byrnes, R.C., D.J. Eastburn, K.W. Tate, and L.M. Roche*. 2018. A global meta-analysis of grazing impacts on soil health indicators. J. Environmental Quality. doi:10.2134/jeq2017.08.0313. The complete findings from this study can be viewed here. WVM Analysis Overview: Which Value-Added Management Programs Really Add Value to Your Cattle?